Born in the shadow of the Brickyard, Zipp Speed Weaponry has a history like no other company in cycling. Headquartered within sight of the Indianapolis Motor Speedway, the Zipp design, production and testing facility is deeply rooted in both motor sports and bicycle racing. Folded into the carbon laminate of every part that leaves the factory is knowledge gained from years of trial, error and wind tunnel testing. The front entryway at Zipp is decorated with project bikes long since discontinued, and a range of wheels from past to present. We recently we had the opportunity to tour Zipp’s Speedway, Indiana, facility. Today, the company employs a fascinating blend of old world craftsmanship and new world technology. Painstaking, labor-intensive handwork combined with sophisticated tooling and machinery results in some of the most advanced components available. But in many ways, a look back at the early years offers insight as to why Zipp has emerged as an industry leader. In part one of this story, we look at the history of the company. Next week, in Part II of this story, we’ll see where Zipp currently stands and how the now-famous wheels are crafted. The company traces its origins directly to open wheel racecars and composites engineering in the late 1980s. Founder Leigh Sargent started as a Formula 1 engineer at Williams in England. He came to Indiana with a CART team, but when the team folded, he stayed to set up shop doing chassis repair, nose boxes and wings. In fact, he invented a molded carbon fiber driver’s seat, a concept that is still in use today. Not sure how the Mohawk would fare in a wind tunnel, but the bike did well. The story goes that one of Sargent’s drivers in 1988 was a cyclist and showed up with a Mavic disc wheel. Cutting edge for its time, the wheel was essentially a big piece of aluminum bonded to a rim and hub and it tipped the scales at a whopping 3000 grams. Sargent looked at it and said, “That’s a piece of crap!” but also saw potential. Using Nomex® honeycomb from a racecar tub, he created a 19mm wide disc wheel that weighed 1400 grams – less than half the weight of the Mavic. Sargent eventually made 12 of the original discs and walked the aisles of the Interbike trade show to see if they would sell. By 1990, he’d refined the wheel, dropping the weight to about 1150 grams with a threaded hub. It was a weight that is nearly competitive with discs currently on the market. Every wheel on display in the front hallway at Zipp has a story, including this original 440. At the same time, Sargent took the unusual step of testing his wheel in the wind tunnel. With his motorsports background, it was a natural move, but one that was uncommon in cycling at the time. As it turned out, that first wheel in the wind tunnel kicked off a long succession of such tests, as the company became one of the first to actually use wind drag data in product development. “A lot of people don’t realize the progression, but when you look at the race photos you see that it went disc, then disc with holes in it, then deep section wheels happened. And it was the wind tunnel that taught us this,” said Poertner. Zipp created the first tri spoke wheel in 1989. It was available in four colors, painted to match the discs, meant to give riders an aerodynamic option in front wheels. Then in 1992, the first Zipp 2001 aero beam frameset went to production. As it happened, both of these products became nearly ubiquitous in the burgeoning sport of triathlon. The 2001 frame was unlike anything previously available. With a massive wing-shaped downtube, no seat tube and a flexible beam acting as both a top tube and perch for the saddle, the wild frame was not widely accepted in the very traditional ranks of pro road riders. But it was a hit on the upstart triathlon scene and came to embody the technologically progressive Zipp brand in the 1990s. Hallways in the building testify to the Zipp company’s early success. Each frame required 45 to 50 hours of labor and the cost was extraordinary, even by today’s standards. But this no-holds-barred approach to the pursuit of technology and the commitment to domestic production, set the tone for Zipp’s approach to the cycling market in the ensuing years. In fact, continuing the technological progression even farther, the 1996 Zipp 3001 frameset marked the first non-aerospace use of boron incorporated with carbon fiber. 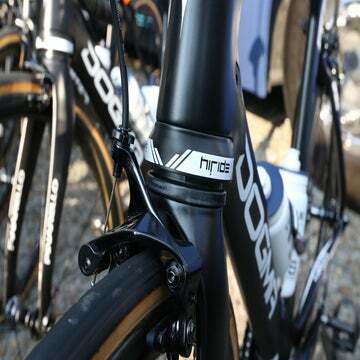 The heavier material is quite strong in compression and has recently been used again, in modern carbon road bars, to reinforce the stem clamp zone. The UCI eventually outlawed the design and the frame was discontinued at the end of 1997. But not before multiple Hawaii Ironman victories and time trial championships established the Zipp name at the head of the class in aerodynamic development. The wild looking Zipp carbon cranks were a full decade ahead of their time. Wing bikes like this were banned by the UCI in the late 1990s, and Zipp stopped producing them in 1997. As it turns out, when one of the three spokes in a tri-spoke rotates into and fills the fork blades, airflow through the fork is restricted and dams up, creating a pressure wave. Furthermore, in a crosswind, the side surface area of the wheel changes, essentially reducing and increasing by one-third as each spoke moves into the shelter of the fork blades and then out again. The shifting center of pressure can cause instability in a crosswind. This thinking drove Zipp toward deep section wheels, the first of their kind. And by 1992, the original 440 deep section carbon wheelset went to production. In 1995, the Zipp 3000 tri-spoke wheelset was discontinued and since then, the company’s wheel development has committed solely to deep section carbon and discs. A recurring theme in the history of Zipp is technological development resulting in products almost too cutting edge for their time. For example, the company offered carbon cranksets in 1997, almost a full ten years before carbon cranks really took off in the modern road market. Somewhat less constrained by tradition, the exploding mountain bike and triathlon markets were more willing to adopt new technologies. Trying to gain traction in the mountain bike market, Zipp carbon hubs were light, stiff, and creatively colored. But the rapid proliferation of new parts for these markets represented a potential loss of focus. Early failures of carbon mountain bike cranks and the lack of acceptance of carbon mountain bike rims in the marketplace (imagine that, in 1998! ), gave Zipp’s management pause and triggered something of a retrenchment. Coincident with these market challenges, in 1998 Zipp (the cycling company) split from Compositech (the motorsports business). Andy Ording, Leigh Sargent’s original employee, bought the cycling side of the business and moved it to a new building, ushering in the modern era for Zipp. Along with the move came a tough decision to refocus on the company’s core strengths: wheels, rims and hubs. All mountain bike products, the frameset and other niche products were dropped in favor of driving road development. 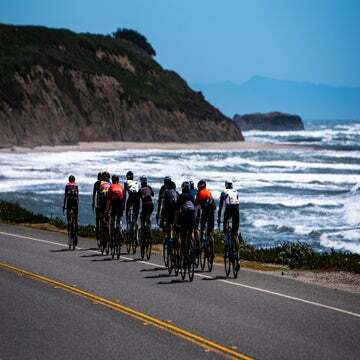 In fact, this is about the time that almost the entire bicycle industry began a seismic shift toward road racing and road bike product development. The fortunate turn of events left Zipp perfectly positioned to create widespread acceptance of deep section carbon fiber road wheels in the professional peloton and subsequently capitalize on their prior years of experience. Check back next week for the second part of our look at Zipp Speed Weaponry.